Wow! 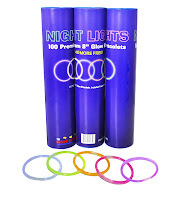 Amazon has 110 8" Premium Glow Sticks for only $8.95! They are originally priced at $19.99. That's a 55% savings! Plus it is eligible for FREE shipping on orders over $25. These bracelets are great party favors for Birthdays and are prefect for camping and clubs.